You are currently browsing the Short and Long Of Home Renovation blog archives for July, 2008. I noticed over the past couple of months that we had been developing dark stains on our Formica countertop near our coffee maker. I don’t know what my husband’s been up to (it had to be him after all)! Or whether it has to do with the can of coffee we’re using or the hot coffee cup or actual coffee spills. We developed one dark ring and a couple of other marks. Today my black tin for loose tea made a mark on the countertop too – so I decided I’d better try to tackle these problems. The first thing that came to mind was lemon juice – since I knew that bleach was a problem with Formica. I’m also trying to use more environmentally friendly products when possible. So I took out our lemon juice. 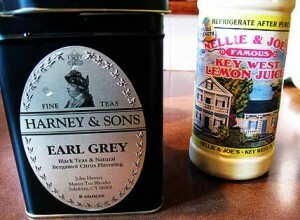 It’s called Nellie & Joe’s Famous Key West Lemon Juice – Double Strength. It has lemon juice in it and lemon oil from concentrate. A tin of tea and some lemon juice! I poured some of the lemon juice onto a paper towel and rubbed it on the tin mark. Nothing happened. Then I went over to the coffee marks and rubbed some lemon juice on them. It looked like they were starting to fade. So I used some more. After a couple of minutes repeating this procedure – I noticed that it actually worked! I got rid of all the stains in the coffee maker area. Then I decided to try again where the tin was. After reapplying the juice a couple of times – it worked too! I got rid of all the stains naturally – with a little elbow grease and lemon juice. Try it out! 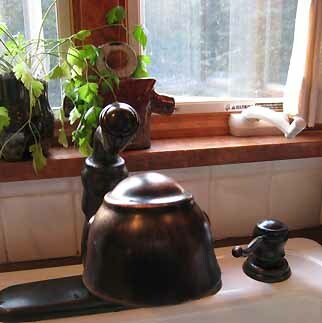 This entry was posted on Wednesday, July 30th, 2008 at 8:32 am	and is filed under Countertops, Green Homes. You can follow any responses to this entry through the RSS 2.0 feed. You can leave a response, or trackback from your own site. Here’s an interesting discussion about bathroom tiles. This entry was posted on Wednesday, July 30th, 2008 at 5:50 am	and is filed under Bathrooms. You can follow any responses to this entry through the RSS 2.0 feed. You can leave a response, or trackback from your own site. I renovated my kitchen and bathroom 2 ½ years ago. Recently I’ve had problems with my bathroom faucet and my kitchen soap dispenser. I figured this would be a good test to see whether or not the 2 faucet companies would stand behind their products. My bathroom faucet is from Pegasus. I purchased it at my local Home Depot store. The handle broke off. Our Pegaus Faucet, with the broken handle. My kitchen sink is a Delta that I purchased from Home Depot Expo. The built-in soap dispenser broke. I didn’t have product numbers easily at hand, so one day when I was in Home Depot I figured I’d ask about the Pegasus and how to replace the handle. The salesperson there wasn’t too helpful, so I decided my best course of action was to consult the internet. They also list their phone number 1-800-345-3358 to call for help. When I called, I got a very polite man who walked me through the type of faucet I have and finally figured out which one it was. Then he had me describe what was wrong with the soap dispenser and told me what part I needed. Then he told me I’d receive it free of charge within 7 – 10 business days. And I did! Next I went to Pegasus’ web site. For some reason their customer service page leads to Home Depot’s site. When I called Home Depot’s web number they gave me a number for Pegasus’ customer service: 1-888-328-2383. I called Pegasus and they walked me through the type of faucet I have. We finally figured it out together. He told me the same thing – he’d send me the part free of charge – which I did soon receive. My only complaint with that one is that now I have to hire someone to put in the handle. Other than that, I’d say that both companies passed the test with flying colors! Both Delta and Pegasus stand behind their faucets. This entry was posted on Tuesday, July 29th, 2008 at 11:32 am	and is filed under Bathrooms, Kitchens. You can follow any responses to this entry through the RSS 2.0 feed. You can leave a response, or trackback from your own site. Here’s an article from Reader’s Digest that discusses a how to install granite tile countertops in your kitchen. They’re a much cheaper alternative to stone. But if you choose to go that route, beware that you’ll have to work a little harder to keep the grout between the tiles clean! This entry was posted on Monday, July 28th, 2008 at 9:57 am	and is filed under Countertops, Kitchens. You can follow any responses to this entry through the RSS 2.0 feed. You can leave a response, or trackback from your own site. Merillat has some helpful layouts of different types of kitchen work triangles. They divide they possibilities into Corridors, Pennisulas and L-Shaped types. It’s great to see the different choices diagrammed! This entry was posted on Sunday, July 27th, 2008 at 9:01 am	and is filed under Kitchens. You can follow any responses to this entry through the RSS 2.0 feed. You can leave a response, or trackback from your own site. If you’re interested in Blanco Kitchen sinks, you can find a bunch of photos of them here. This entry was posted on Wednesday, July 23rd, 2008 at 6:35 pm	and is filed under Kitchens. You can follow any responses to this entry through the RSS 2.0 feed. You can leave a response, or trackback from your own site.